Quincy Delight Jones, Jr. (ojoibi March 14, 1933) je ara ile Amerika to je alakoso orin, atokun awo orin, eleto orin, alasopo orin filmu, atokun telifisan, ati afonfere. Larin adota odun to fi sise ninu ise faaji, Jones gba idaloruko fun Ebun Grammy ni igba 79 to je eni akoko to gba eyi, 27 awon Ebun Grammy, ti Ebun Akikanju Grammy ni 1991 je ikan ninu won. O gbajumo gege bi atokun awo orin Thriller, ti Michael Jackson gbe jade ni 1982, eyi to ta iye to je 110 legbegberun kakiriaye, ati atokun ati alakoso orin ore anu “We Are the World”. ↑ 1.0 1.1 Callaway, Sue (2007-01-28). 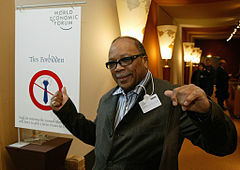 "Fortune test drives a Mercedes Maybach with Quincy Jones — February 5, 2007". Money.cnn.com. Retrieved 2009-07-18. Àtunṣe ojúewé yi gbẹ̀yìn wáyé ni ọjọ́ 9 Oṣù Kẹta 2013, ni ago 05:09.